1. J. Crew shirt. 2. Zara blazer. 3. BaubleBar necklace. 4. J. Crew pants. 5. Kate Spade studs. 6. Tory Burch flats. Job interviews are downright nerve-racking. How you dress for the occasion often depends on the industry you’re in, but one thing is always certain: the last thing you want to be worrying about is your outfit. I recently interviewed at Facebook. Here in the Bay Area, it’s common to skip the suit in favor of more casual attire. How casual? A friend wore jeans while interviewing with a Silicon Valley tech giant and got the job. No matter what, you should pick something that makes you feel comfortable and confident. 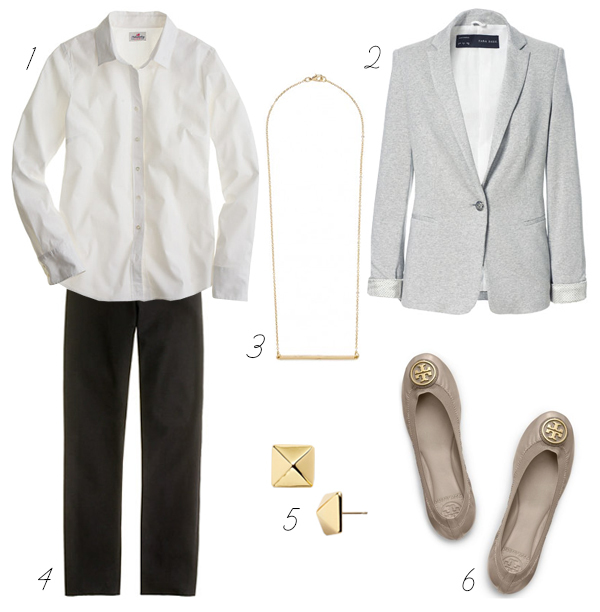 For me, that’s smart staples like my cropped black pants, a crisp white shirt, relaxed blazer, and simple jewelry. I tried everything on a few days before the interview to check for wrinkles, then moved these pieces to the front of my closet so that on the day of, getting dressed would be a no-brainer. Since I’m a little out of practice walking in heels, I gave myself one less thing to stress about and put on a trusty pair of flats. I was still nervous—no outfit can cure that—but prepared both mentally and physically. Now comes the fun part: deciding what to wear for my first day on the job. Thanks, BA! I can now report that they give you a hoodie on your first day. True story. Congrats on the new job! =) As always, loving a style that says 'i am both smart and good-looking'! Good luck with the first working day! Congrats! I know a family friend who also made the hop from Google to Facebook. Your style is so on-point and you're smart too which is part of why I love your blog. It's well-written, interesting, and real. Lauren, your comment totally made my day :) Thank you!